Functional NK cell deficiencies are associated with autoimmune diseases, including multiple sclerosis. NK cells can promote or inhibit adaptive immunity via either cytokine production or cytotoxicity toward immature dendritic cells and activated T cells. In humans, this immunoregulatory role resides in the CD56bright NK cell subset, which is selectively expanded by daclizumab, a CD25-blocking Ab that suppresses multiple sclerosis-associated inflammation. The objective of this study was to investigate the molecular mechanisms underlying the cytotoxicity of NK cells toward activated T cells. We demonstrated that NK cells induce caspase-independent apoptosis that requires NK cell degranulation and causes mitochondrial dysfunction in activated T cells. Although both granzyme A and granzyme K (GrK) can mediate this form of apoptosis, quantitatively we observed preferential transfer of GrK to target cells. Consequently, gene silencing of GrK in the NK-92 cell line, which retains functional characteristics of CD56bright NK cells, profoundly inhibited the ability of NK-92 cells to kill activated syngeneic T cells. Finally, we demonstrated that daclizumab treatment significantly enhanced this newly defined mechanism of cytotoxicity by CD56bright NK cells. Our study describes the important physiological role that GrK plays in immunoregulation of adaptive immunity in humans and indicates that therapeutic exploitation of this pathway is beneficial in controlling autoimmunity. Multiple sclerosis (MS) is the most prevalent demyelinating disorder of the CNS. It is thought that MS is caused by inappropriately activated T cells that target unknown CNS Ags. The immune-mediated pathophysiology of MS is supported by the efficacy of immunomodulatory drugs and by MS genetic studies (1). However, it remains unclear whether the pathogenic population resides in CD4+ or in CD8+ T cells (2). Drugs that restore defective immunoregulatory circuits underlying the breakdown of immune tolerance can provide therapeutic benefit in autoimmune diseases without a need to define the target of the immune response or the precise immunopathogenic cell population. For this reason, researchers have focused attention on regulatory T cells, leading to the identification of functional deficiencies in FOXP3+CD4+ T cells (3) and IL-10–secreting Tr1 cells (4) in MS patients. However, adaptive immune responses are also regulated by the components of innate immunity, especially by NK cells (5–7). In the past 30 y, many studies indicated that immune dysregulation in MS includes quantitative and functional deficiencies in NK cells (8–14). The data from experimental autoimmune encephalomyelitis, a murine model of MS, also suggest that NK cells have a regulatory role in experimental autoimmune encephalomyelitis (5, 15). While studying the mechanism of action of daclizumab, a humanized mAb against the IL-2Rα–chain (CD25) that appears to be a highly effective therapy for MS (16–18), we discovered that daclizumab selectively expands and activates CD56bright NK cells (19, 20). In vivo expansion of these cells correlated with contractions in absolute numbers of T cells observed during daclizumab therapy and with the inhibition of MS brain inflammatory activity (18–20). We have shown that daclizumab-expanded CD56bright NK cells play a key role in limiting adaptive immune responses by their focused cytotoxicity toward activated T cells (19). However, the molecular mechanisms of this cytotoxicity have remained undefined. NK cells comprise ∼5–15% of human PBMCs and play a crucial role in early defense against pathogens, especially viruses. NK cells kill target cells by two major mechanisms: the death receptor pathway and the granule exocytosis pathway. The death receptor pathway consists of membrane-bound or soluble factors belonging to the TNF superfamily that interact with one of the membrane-bound TNFR superfamily agents (21). Trimerization of TNFRs (e.g., TNFR1, Fas, and TRAIL receptors) activates death domains in their intracellular tails, which leads to activation of caspases and cell death. The granule exocytosis pathway is dependent on the pore-forming protein perforin, which delivers serine proteases called granzymes into the cytoplasm of target cells. Humans express five granzymes: A, B, H, K, and M (22). Although the biological actions of granzyme A (GrA) and granzyme B (GrB) have been well characterized (23), very little is known about the function of the remaining granzymes. GrB induces fast cell death, predominantly by activation of caspases. In contrast, GrA induces a caspase-independent cell death, characterized by direct mitochondrial damage, which results in an increase in intracellular reactive oxygen species (ROS) and single-stranded nicking of DNA. In agreement with the crucial role of ROS in GrA-dependent cytotoxicity, superoxide scavengers can block GrA-mediated cell death (24). When recombinant granzyme K (GrK) is delivered to target cells in vitro, it induces caspase-independent cell death that is morphologically and biochemically very similar to GrA-mediated apoptosis, even though GrA and GrK cleave mostly nonoverlapping substrates (25, 26). To our knowledge, there has been only a single study investigating the physiological role of GrK in cell-mediated cytotoxicity in humans; this study suggested that GrK may play a physiological role in mediating cytotoxicity of human in vitro-generated lymphokine-activated killer cells to cancer cell lines (26). The decision of an NK cell to kill its target results from the integration of signals from inhibitory and activating receptors (27). In general, the effect of MHC-I–specific inhibitory receptors dominates over that of NK cell-activating receptors (28, 29). However, several studies have reported that NK cells can kill autologous cells expressing normal levels of MHC-I molecules (19, 30). In both cases where human NK cells were shown to kill cells expressing self–MHC-I molecules, that is, dendritic cells (DCs) (30) and activated T cells (19), the cytotoxicity toward autologous cells resided in the CD56bright NK cell subset. Intriguingly, CD56bright NK cells were originally thought to lack cytotoxic potential (31) because of their significantly lower expression of perforin and virtually complete lack of GrB, in comparison with CD56dim NK cells (32). However, CD56bright NK cells express levels of GrA comparable to those in CD56dim NK cells, and they are almost all GrK+, whereas CD56dim NK cells (and virtually all CD4+ T cells) lack GrK expression (32, 33). In addition to daclizumab, other successful MS therapies, such as IFN-β, also activate or expand CD56bright NK cells (34, 35). This, together with the observations that impaired cytolytic activity of NK cells can lead to progressive CNS inflammation (36) and that MS susceptibility may be linked to perforin genotype (37), suggests that immunoregulation via CD56bright NK cells plays an important role in the development of CNS autoimmunity. Thus, defining the exact molecular mechanism by which CD56bright NK cells regulate autologous T cell responses may provide additional therapeutic targets for the development of optimized therapies for MS. In this article we describe that CD56bright NK cells kill autologous activated T cells through GrK- and GrA-mediated cytotoxicity, which requires formation of ROS in target cells and can be potently inhibited by application of strong antioxidants. Abs against human CD3 (HIT3a), CD4 (RPA-T4), CD8 (SK1), CD56 (B159), CD107a (H4A3), GrA (CB9), GrB (GB11), perforin (δG9), and active caspase-3 (C92-605), as well as annexin V, were purchased from BD Biosciences (San Diego, CA). Abs against GrK (GM6C3), GrK-small interfering RNA (siRNA) and control-siRNA were obtained from Santa Cruz Biotechnology (Santa Cruz, CA). Concanamycin A (CMA), TRAIL R2-Fc chimera, mAb to Fas (SM1/23), and Ac-IETD-CHO were from Alexis Biochemicals (San Diego, CA). Pan-caspase inhibitor Z-VAD-FMK and anti-human CD27/TNFRSF7 Ab (goat IgG) were from R&D Systems (Minneapolis, MN). Bongkrekic acid and N-acetyl-l-cysteine (NAC) were from Sigma-Aldrich (St. Louis, MO). CFSE, 5-(and-6)-carboxy-2′7′-dichlorodihydrofluorescein diacetate (carboxy-H2DCFDA), 3,3′-dihexyloxacarbocyanine iodide (DiOC6), and 5,5′,6,6′-tetrachloro-1,1′,3,3′-tetraethylbenzimidazol-carbocyanine iodide (JC-1) were from Invitrogen (Carlsbad, CA). EGTA was from Calbiochem (San Diego, CA). PBMCs were isolated from venous blood or lymphocytaphereses of daclizumab-treated or untreated MS patients and healthy donors by buoyant density centrifugation over Ficoll-Paque (Pharmacia, Piscataway, NJ) and were used fresh or cryopreserved. All human subjects signed informed consent and participated in Institutional Review Board-approved protocols. The NK-92 cell line, an IL-2–dependent NK cell line derived from PBMCs from a 50-y-old Caucasian male with rapidly progressive non-Hodgkin’s lymphoma (38), was obtained from American Type Culture Collection (Rockville, MD) and grown in α-MEM supplemented with 12.5% FCS, 12.5% horse serum, 100 IU IL-2, and 50 μM 2-ME in a humidified incubator at 37°C in 5% CO2. For CFSE staining, the cells were labeled with 2 μM CFSE as described (19). T cells were purified from PBMCs using negative selection by magnetic beads (T cell isolation kit II; Miltenyi Biotec, Auburn, CA). Purified T cells were polyclonally stimulated with anti-CD3/CD28 beads (Dynalbeads; Invitrogen) for an indicated time (72 h) and served as the target cells. Autologous or syngeneic NK cells (effector cells) were isolated from PBMCs by negative selection (NK isolation kit II; Miltenyi Biotec). NK cells and autologous T cells were cocultured at different E:T ratios in 96-well plates. Controls consisted of T cells alone (without NK) and NK cells alone (without T cells). Cells were then collected, stained with surface Abs and annexin V, and analyzed by flow cytometry. Live T cells were gated as CFSE+annexin V−CD3+ T cells, and their relative numbers were calibrated with fluorescent beads. Cytotoxicity was determined by the following formula: % cytotoxicity = [(relative T cell numbers in T cell control − relative T cell numbers in the sample)/relative T cell numbers in T cell control] × 100%. Fluorescently labeled CD107a Ab (added to NK cell–T cell cocultures) was used to identify the degranulation of NK cells. In the blocking experiment, the assay was performed in the presence of 1 mM EGTA, 20 μM bongkrekic acid, 0.5 mM NAC, 25 μM Ac-IETD-CHO, 50 nM Z-VAD-FMK, 2.5 μg/ml anti-Fas Ab, 5 μg/ml TRAIL R2-Fc chimera, or 5 μg/ml anti-CD27 Ab. After incubation with specific Abs against relevant surface molecules, the cells were fixed in BD Cytofix/CytoPerm solution and then washed with BD Perm/Wash buffer. Subsequently, cells were incubated with fluorescently conjugated Ab against granzymens or perforin, washed, and analyzed on a LSR II flow cytometer (BD Biosciences, San Diego, CA). ROS production was monitored by adding 1 μM H2DCFDA for the last 30 min of T cell–NK cell cocultures just before flow cytometry analysis. H2DCFDA is converted into a nonfluorescent derivative (2′,7′-dichlorodihydrofluorescein, or H2DCF) by cellular esterases. H2DCF is oxidized to the highly fluorescent 2′,7′-dichlorofluorescein (DCF) by intracellular ROS. Thus, the intensity of the DCF fluorescence correlates with the levels of intracellular ROS. As a positive control, cells were treated with 1% H2O2. The change of mitochondrial transmembrane potential (ΔΨm) was monitored by adding 0.5 μM potential-dependent J-aggregate–forming lipophilic cation JC-1 or 20 nM cationic lipophilic dye DiOC6 to the cells, followed by incubation for 15 min in 5% CO2 at 37°C. Cells were exposed to 50 μM carbonyl cyanide 3-chlorophenylhydrazone, which disrupts mitochondrial membrane integrity, as a positive control. After staining with appropriate fluorescent-conjugated Abs, the cells were washed and analyzed by flow cytometry. Data acquisition and analysis were performed using FACSDiva software. Activated CD4+T cells isolated with CD4-labeled MACS beads (Miltenyi Biotec) from negatively selected T cells were cocultured with syngeneic NK cells in slide chambers for 3 h. Cells were stained with surface (anti-CD4 and -CD56) and intracellular (perforin or GrK) primary Abs followed by a fluorescently labeled appropriate secondary Ab. Slides were mounted using the ProLong antifade kit (Molecular Probes, Eugene, OR). Confocal microscopy was performed using a Zeiss fluorescence microscope with Velocity software. Polyclonally activated CD4+ T cells were coincubated with syngeneic NK cells for 3 h, followed by surface staining for CD3, CD4, and CD56 and intracellular staining for GrK and perforin. Data acquisition (20,000 cells/sample) was performed with the Amnis ImageStream system (Amnis, Seattle, WA) and data were analyzed with IDEAS 4.0 software. The NK-92 cell line (5 × 106 cells) was transfected with 30 pmol GrK siRNA or control siRNA using Amaxa Nucleofector program A-024 (Amaxa Biosystems, Gaithersburg, MD). Plasmid pmaxGFP was used to detect the transfection efficiency. The transfection efficiency and quantification of GrK protein expression were performed 14–16 h posttransfection by flow cytometry. Statistical analysis was calculated using a Student t test for analysis of two independent subgroups or paired t test for analysis of repeated measurements within identical groups of patients. Nonparametric equivalent tests were used when data were not normally distributed. All analyses were graphed using SigmaPlot 11 software with p < 0.05 considered to be significant. A modified flow cytometry killing assay, which distinguishes and enumerates targets and effectors in complex cell mixtures, was applied in the study. Target cells (purified T cells used without activation stimulus or after polyclonal activation with CD3/CD28 beads) were CFSE-labeled just prior to coculture with NK cells, and fluorescently labeled Abs recognizing LAMP protein (CD107a) were added to NK cell–T cell cocultures. T cells cultured in the absence of NK cells and NK cells cultured in the absence of T cells served as negative controls. After the indicated time period, an equal number of fluorescent microbeads was added to each cell culture and the number of live targets was proportionally enumerated as the number of CFSE-labeled/annexin V-negative CD4+ and CD8+ T cells per 1000 microbeads. At the same time, the proportion of CD107a+ NK cells indicated the number of NK cells that degranulated in these assays. As demonstrated in Fig. 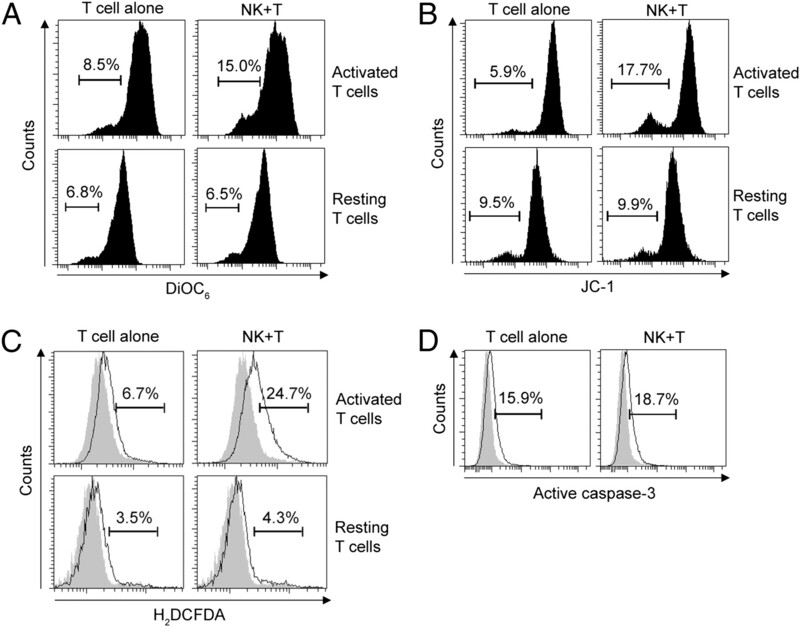 1, we observed that NK cells kill only activated, but not resting, autologous T cells (Fig. 1A). 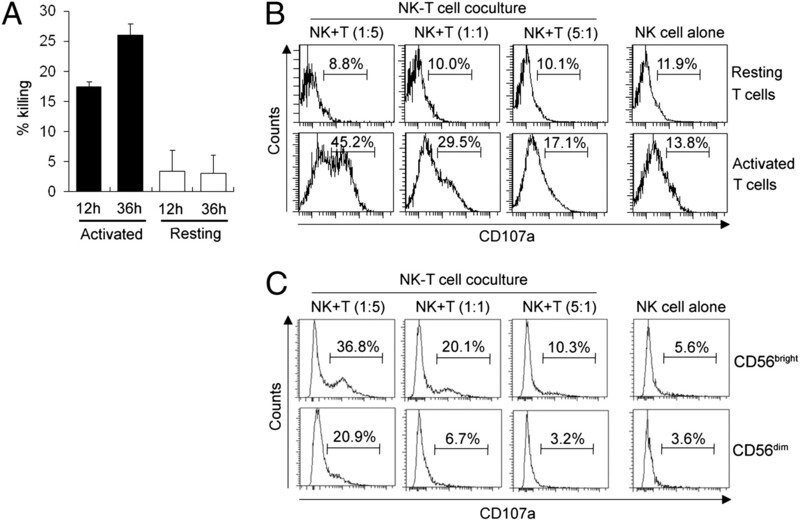 When NK cells were cocultured with resting T cells, we did not observe an increase in NK cell degranulation in comparison with NK cells cultured in the absence of T cells (Fig. 1B, upper panels), whereas coculture of NK cells with activated T cells resulted in a significant increase in NK cell degranulation (Fig. 1B, lower panels). When gating on CD56bright and CD56dim NK cells separately, we observed preferential degranulation of CD56bright NK cells (Fig. 1C). NK cells kill activated but not resting autologous T cells, and more degranulation is detected in CD56bright NK cells. A, Resting or polyclonally activated T cells (targets, T) were CFSE labeled and cocultured with syngeneic NK cells (effectors, E) for 12 and 36 h at an E:T ratio of 1:5. Live targets were identified as CFSE+CD3+annexin V− T cells and were proportionally enumerated between conditions by normalization of T cell numbers to the numbers of fluorescently labeled beads added in equal number to all conditions before flow cytometry analysis. The number of live T cells cultured without NK cells was considered 100%, and decreases in the number of live T cells in cultures with NK cells reflected the proportion of killed T cells. Error bars represent SDs. B, Resting or polyclonally activated T cells were coincubated with syngeneic NK cells for 24 h at various E:T ratios in the presence of anti-CD107a Ab. Individual plots represent the proportion of degranulating (CD107+) CD3−CD56+ NK cells. C, Polyclonally activated T cells were coincubated with syngeneic NK cells for 24 h at various E:T ratios in the presence of anti-CD107a Ab. Individual plots represent the proportion of degranulating (CD107+) CD3−CD56bright and CD3−CD56dim NK cells. Results shown are representative of the data obtained from three independent experiments. We evaluated the mechanism of killing by systematically utilizing different blocking agents, as schematically defined in Fig. 2A. The optimal concentration of all reagents was defined in preliminary experiments as the concentration with the maximal inhibitory effect on NK-mediated cytotoxicity that did not inhibit survival or proliferation of activated T cells (data not shown). NK-mediated killing of autologous T cells is degranulation-dependent but not death receptor-dependent. A, Schematic depiction of the experiments aimed at defining the predominant mechanism of NK-mediated killing of activated autologous T cells. Polyclonally activated T cells were stained with 2 μM CFSE and were coincubated with syngeneic NK cells for 48 h at the indicated E:T ratio (1:5) in the presence or absence of 50 nM Z-VAD-FMK (B), 2.5 μg/ml anti-Fas Ab (C), 5 μg/ml TRAIL R2-Fc chimera (D), 5 μg/ml anti-CD27 Ab (E), 1 mM EGTA (F), 0.5 mM NAC (G), 20 μM bongkrekic acid (H), or 25 μM Ac-IETD-CHO (I). Live targets were identified as CFSE+CD3+annexin V− T cells. Live T cells were proportionally enumerated between conditions by normalization of T cell numbers to the numbers of fluorescently labeled microbeads added in equal numbers to all conditions just before flow cytometry analysis. The killing rate was calculated according to the description in Materials and Methods and Fig. 1. Results shown are representative of the data obtained from three independent experiments. Pan-caspase inhibitor Z-VAD-FMK had minimal inhibitory effect on NK cell-mediated cytotoxicity of activated T cells (Fig. 2B). Consistently, we observed no significant inhibitory effects from reagents that block different death receptor pathways, such as Fas- (Fig. 2C), CD27- (Fig. 2D), or TRAIL-mediated killing (Fig. 2E). In contrast, we observed 71% inhibition of NK cell-mediated killing of activated T cells by EGTA, which blocks Ca2+-dependent degranulation of NK cells (Fig. 2F). Bongkrekic acid, which blocks formation of mitochondrial permeability transition pore and superoxide scavenger NAC, had similarly potent inhibitory effects on NK cell-mediated cytotoxicity (Fig. 2G, 2H), indicating that activated T cells die predominantly by mitochondrial apoptosis associated with the formation of ROS. This form of apoptosis is predominantly induced by GrA and GrK. However, GrB, which typically induces caspase activation, may also contribute to caspase-independent killing. Therefore, we tested the contribution of GrB to NK cell-mediated cytotoxicity by applying the specific GrB inhibitor Ac-IETD-CHO (Fig. 2I). We observed only a mild inhibitory effect (22%) of Ac-IETD-CHO on NK cell-mediated killing of activated autologous T cells. The previous experiments indicated that NK cells kill by a caspase-independent pathway, inducing mitochondrial dysfunction and ROS production in activated T cells. Therefore, we measured ΔΨm induced in T cells by coculture with autologous NK cells. Using two different fluorescent reporter dyes, DiOC6 (Fig. 3A) and JC-1 (Fig. 3B), we observed a significant decrease in ΔΨm in activated (but not resting) T cells after 3 h coculture with NK cells. In the same timeframe, activated T cells also significantly enhanced their intracellular ROS production upon coculture with autologous NK cells (Fig. 3C). In contrast, coculture with NK cells did not result in enhanced activation of caspase-3 in activated T cells (Fig. 3D). NK cells induce mitochondrial dysfunction in T cells. Polyclonally activated T cells or resting T cells were coincubated with syngeneic NK cells for 3 h at an E:T ratio of 1:2. Lipophilic potential-dependent fluorescent dyes DiOC6 (A) or JC-1 (B) were added for the last 15 min coculture. Subsequently, cells were stained for surface markers and analyzed by flow cytometry. Individual plots represent DiOC6 and JC-1 fluorescence on gated target (CD3+) T cells. The level of DiOC6 and JC-1 fluorescence correlates with Ψm; thus, cells with a low level of DiOC6 and JC-1 fluorescence represent dying cells with mitochondria that lost Ψm. C, The formation of intracellular ROS in resting or polyclonally activated T cells after 3 h coculture with syngeneic NK cells was measured by adding 1 μM carboxy-H2DCFDA to the last 30 min of coculture. H2DCFDA is converted into a nonfluorescent derivative (H2DCF) by cellular esterases, and H2DCF is oxidized to the fluorescent DCF by intracellular ROS. Results represent percentage of ROS+ T cells. D, Polyclonally activated T cells were analyzed for intracellular expression of active caspase-3 by flow cytometry after 3 h coincubation with syngeneic NK cells. Filled histograms represent appropriate controls. Results shown are representative of the data obtained from three independent experiments. Consistent with a previously published report (32), we observed that polyclonally activated T cells express GrA and GrB, but little GrK and perforin (Fig. 4A). As expected, CD8+ T cells express significantly higher levels of granzymes and perforin in comparison with CD4+ T cells. After 3 h coculture with autologous NK cells, activated T cells contained significantly higher amounts of perforin and granzymes in comparison with activated T cells cultured in the absence of NK cells (Fig. 4A; compare left and right panels for each granzyme and perforin). Quantitatively, the change was most robust for GrK (Fig. 4B) and perforin (Fig. 4C), for which we observed a >15-fold increase in GrK and a >40-fold increase in perforin expression in CD4+ T cells after 3 h coculture with NK cells. In comparison, for GrA and GrB, we observed on average only a 1- to 2-fold increase. There was no enhanced staining for any of the granzymes or perforin upon coculture of resting T cells with autologous NK cells (data not shown). Perforin and granzymes transfer from NK cells to activated T cells. Polyclonally activated T cells were cultured alone or coincubated with syngeneic NK cells at an E:T ratio of 1:1 for 3 h. Cultures were then stained for surface markers (CD3, CD4, CD8, CD56) and, after fixation and permeabilization, for proteins of cytolytic granules. Individual graphs display percentage of CD8 (blue) and CD4 (red) T cells expressing GrA, GrB, GrK, and perforin (A). Fold increase in granzymes (B) and perforin (C) expression in activated T cells cocultured with NK cells was calculated from experiments on three different subjects using T cells alone as reference. D, After NK and T cells were coincubated for 3 h and the intracellular staining of GrK was performed, cells were analyzed by Amnis ImageStream to detect single T cells and NK cell–T cell conjugates. Original magnification ×40. Results shown are representative of the data obtained from two independent experiments. Because the rate of increase in granzymes and perforin staining in activated T cells upon coculture with NK cells was too fast (as early as 1 h and peak at 3 h) to suggest de novo synthesis, we considered the most likely explanation for this observation being transfer of perforin and granzymes from effector NK cells to target cells. This interpretation was supported by our previous observation that CD56bright NK cells degranulate preferentially in coculture with autologous activated T cells (Fig. 1C) and by almost exclusive expression of GrK in CD56bright as opposed to CD56dim NK cells (Supplemental Fig. 1). First, we verified the intracellular location of transferred perforin and granzymes in activated T cells by confocal microscopy (Supplemental Fig. 2). For all microscopy experiments we used purified CD4+ T cells as target cells and focused on GrK and perforin, as activated CD4+ T cells were almost uniformly GrK- and perforin-negative when cultured in the absence of NK cells (Fig. 4A). We were able to readily identify CD4+ T cells with intracellular expression of perforin and GrK after 3 h coculture with NK cells, whereas such CD4+ T cells were virtually absent when activated T cells were cultured alone (Supplemental Fig. 2). However, because confocal microscopy could not quantify the phenomenon of perforin and GrK transfer, we switched to Amnis ImageStream technology, which combines the visualizing capability of confocal microscopy with quantitative analysis of flow cytometry (Fig. 4D). We observed that when activated CD4+ T cells were cultured alone, only 0.74% of these cells expressed GrK. When expressed, GrK had a distinctly granular staining in the cytoplasm of activated CD4+ T cells (Fig. 4D, upper panel, third row). Upon coculture with autologous NK cells, we observed formation of NK cell–T cell conjugates (Fig. 4D, middle panel). In the early stages of conjugate formation, GrK was fully contained in NK cells (Fig. 4D, middle panel, upper two rows). However, in later stages of conjugate formation, we observed transfer of GrK from NK cells to CD4+ T cells with subsequent dimmer staining of GrK in NK cells (Fig. 4D, middle panel, bottom two rows). When we gated on singlet CD4+ T cells in the cocultures with NK cells, we observed that the proportion of GrK expressing CD4+ T cells increased from 0.74 to 7.26% (Fig. 4D, lower panel). Furthermore, the morphology and cellular distribution of GrK staining in these CD4+ T cells changed noticeably. Instead of predominantly granular distribution of GrK observed in CD4+ T cells when cultured alone (Fig. 4D, upper panel), the cocultured GrK+CD4+ T cells exhibited largely diffuse GrK staining in the entire cytoplasm. Additionally, these cells expressed much lower levels of both CD4 and CD3 on the cell surface, compared with normal CD4+ T cells, and, as shown in the bright field channel, these cells exhibited morphological features of apoptotic cells, such as smaller size, pyknotic nuclei, and apoptotic membrane blebs (Fig. 4D, lower panel). Because the rate of increase in granzymes and perforin staining in activated T cells upon coculture with NK cells was too fast (as early as 1 h and peak at 3 h) to suggest de novo synthesis, we considered the most likely explanation for this observation being the transfer of perforin and granzymes from effector NK cells to target cells. To investigate whether blocking NK cell degranulation would result in decreased GrK and perforin staining in target T cells and the inhibition of their apoptosis, we used CMA, which is a potent and specific H+-ATPase inhibitor and can interfere with intracellular protein trafficking, to block NK cell degranulation. Whether we added CMA directly to coculture of NK cells with activated T cells or selectively pretreated NK cells with CMA before NK cell–T cell coculture, we observed a significant inhibition of GrK (Fig. 5A) and perforin transfer (Fig. 5B) from NK cells to activated T cells. This inhibition of GrK and perforin transfer resulted in a significant inhibition of ROS production in activated T cells (Fig. 5C). Blockade of NK cell degranulation inhibits GrK/perforin transfer and ROS production in T cells. 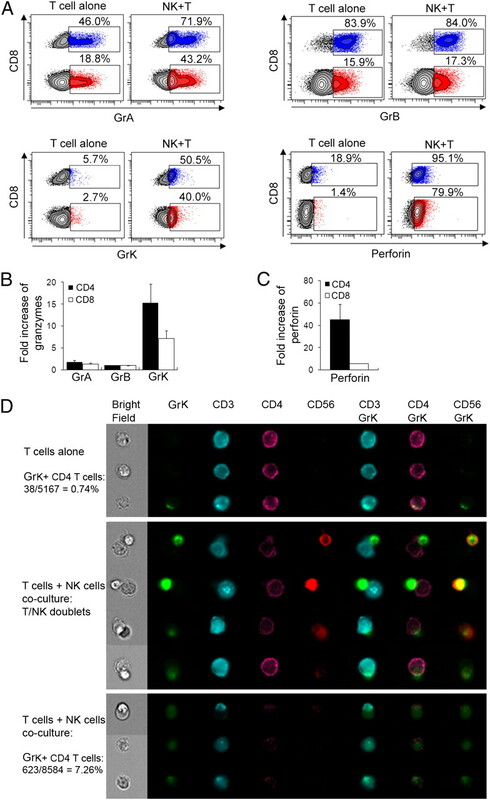 Polyclonally activated T cells were coincubated with CMA-pretreated or untreated (control) NK cells for 3 h. Results represent intracellular staining of GrK (A) and perforin (B) in CD3+CD56− T cells. Open histograms represent GrK or perforin staining on activated T cells that were cultured alone, and filled histograms represent GrK and perforin staining on T cells cocultured with syngeneic NK cells. C, Polyclonally activated T cells were coincubated with CMA-pretreated or untreated NK cells at an E:T ratio of 1:2 for 3 h. Carboxy-H2DCFDA (1 μM) was added and the culture was continued for an additional 30 min. After staining with fluorescently labeled anti-CD56 and anti-CD3 Abs, the cells were washed and analyzed by flow cytometry. Filled histograms depict negative controls. Fold increases of GrK, perforin, and ROS production were shown as mean ± SEM. *p < 0.05, **p < 0.01. Results shown are representative of the data obtained from three independent experiments. All previous experiments indicated that GrK plays a crucial role in the cytotoxicity of CD56bright NK cells toward autologous activated T cells. To our knowledge, this represents the first description of a physiological role of GrK in cell-mediated cytotoxicity in humans, so we wanted to confirm that GrK directly mediates this cytotoxicity by gene silencing experiments. Unfortunately, consistent with published reports, we found primary human NK cells resistant to different modes of transfection and eventually had to use the immortalized NK-92 cell line, which retains crucial functional features of CD56bright NK cells, including GrK expression. We obtained molecular MHC-I typing of the NK-92 cell line (HLA-A*0311, B*0744, Cw*0716) by the National Institutes of Health Blood Bank Department and selected an MHC-I–matched healthy donor as a source of syngeneic T cells. In preliminary experiments we confirmed that NK-92 cells, similar to primary CD56bright NK cells, kill syngeneic activated T cells by inducing the mitochondrial/ROS-dependent form of apoptosis (Fig. 6 and data not shown). Gene silencing of GrK in NK-92 cell line affects the ability of NK-92 cells to kill syngeneic activated T cells. A, NK-92 cells were transfected with 30 pmol GrK-siRNA or control-siRNA by nucleofection and were subsequently stained with fluorescently labeled anti-CD56 Ab. The cells were then fixed and permeabilized for intracellular staining with GrK-Ab. The results were analyzed by flow cytometry, and data were shown in mean fluorescent intensity (MFI) of GrK. B, Polyclonally activated T cells whose HLA-I haplotype was matched with NK-92 cells were coincubated with control-siRNA– or GrK-siRNA–transfected NK-92 cells for 3 h. Carboxy-H2DCFDA (1 μM) was added for the last 30 min of coculture and target cells were analyzed for intracellular ROS production by flow cytometry. Fold increase of ROS production induced by coincubation of activated T cells with control-siRNA– or GrK-siRNA–treated NK-92 cells is depicted as mean ± SEM. C, Polyclonally activated T cells were coincubated with control-siRNA– or GrK-siRNA–transfected NK-92 cells for 6 h at various E:T ratios. Live T cells (CD3+annexin V−) cells were proportionally enumerated by normalization of T cell numbers to the numbers of fluorescent microbeads added in equal number to all conditions just before flow cytometry analysis. The killing rate is depicted as mean ± SD. *p < 0.05, **p < 0.01. The data are representative of two independent experiments. Electroporation of the NK-92 cell line with GrK siRNA resulted in a 47% decrease in GrK staining as compared with electroporation with control siRNA (Fig. 6A), whereas there was no change in the expression of GrA (data not shown). Upon coculture of activated MHC-I–matched T cells with GrK-siRNA–pretreated NK cells, we observed a significant decrease in ROS formation in the target cells as compared with cocultures with control siRNA-pretreated NK cells (Fig. 6B). This translated into a significant (42–71%) inhibition of NK-92–mediated cytotoxicity toward matched activated T cells (Fig. 6C). We stained NK cells in fresh blood samples from 10 untreated MS patients or healthy controls and 10 MS patients who had been on long-term (>1 y) daclizumab therapy. We confirmed that daclizumab-treated MS patients had significantly expanded CD56bright NK cells (19) (Supplemental Fig. 3A), resulting in a significantly lower T cell-to-NK cell ratio in peripheral blood (Supplemental Fig. 3B). Moreover, NK cells, especially CD56bright NK cells in daclizumab-treated MS patients, had significantly higher expression of GrK (3.1-fold increase) and GrA (1.8-fold increase) in comparison with controls (Fig. 7A). Effect of daclizumab treatment on NK cell cytotoxicity to autologous activated T cells. A, Intracellular staining of NK cells in fresh blood samples collected from 10 untreated and 10 daclizumab-treated MS patients. B, Polyclonally activated T cells obtained from cryopreserved PBMCs collected before (baseline) or 6–8 mo after daclizumab treatment (treatment) were coincubated with NK cells derived from respective PBMC samples for 3 h. Results represent the percentage of granzyme/perforin-positive T cells in representative patients and fold increase of granzyme transfer (C) in the whole cohort (n = 6). Polyclonally activated T cells isolated from baseline or daclizumab-treated samples were coincubated with syngeneic NK cells for 3 h, and ROS production (D) and mitochondrial dysfunction (E) in T cells were detected by flow cytometry using 1 μM carboxy-H2DCFDA or 0.5 μM JC-1, respectively. Filled histograms represent negative controls. The left panels depict representative patient data, and the right panels depict group data (n = 8). *p < 0.05, **p < 0.01, ***p < 0.001. Having obtained these encouraging results, we thawed cryopreserved PBMC samples from the National Institutes of Health daclizumab MS trial (http://www.ClinicalTrials.gov, identifier NCT00071838) (20) to investigate whether we could substantiate these observations using samples from pretreatment baseline versus months 6–8 of daclizumab therapy (Fig. 7B–E). We observed that in comparison with cells from baseline samples, NK cells isolated from daclizumab therapy samples were significantly more efficient (2- to 3-fold) in GrK transfer to autologous activated T cells (Fig. 7B, 7C), whereas daclizumab therapy had no effect on transfer of other granzymes. Correspondingly, NK cells isolated from daclizumab therapy samples induced significantly higher ROS formation (Fig. 7D) and more profound mitochondrial dysfunction (Fig. 7E) in autologous target T cells as compared with NK cells isolated from pretreatment samples. NK cells have traditionally been viewed as simple effectors of innate immune responses. However, growing evidence now points toward their important role in restraining T cell responses during viral infections (39) and in animal models of autoimmunity (5, 6, 40, 41). The regulatory role of NK cells in human autoimmunity is indirectly supported by observations of quantitative or qualitative NK cell defects in peripheral blood of patients with autoimmune diseases (42, 43), including MS (8–14). An immunoregulatory role for CD56bright NK cells was inferred from their ability to produce a large number of different cytokines early in the development of the immune response (44) and their ability to home to lymph nodes (45) and make prolonged contact with DCs (46). The original assumption that these cells were not cytotoxic was ruled out by the surprising observation that CD56bright NK cells kill autologous immature DCs (30). We further extended these observations by demonstrating that CD56bright NK cells also kill autologous activated T cells in a degranulation-dependent manner (19). Examination of the mechanisms of cytotoxicity of CD56bright NK cells was facilitated by the fact that this minute cell population in human blood is expanded several fold by the treatment with the CD25-blocking mAb daclizumab (18–20). Having access to significantly expanded CD56bright NK cell populations from daclizumab-treated MS patients allowed us to perform extensive in vitro functional studies to define the mechanisms used by CD56bright NK cells to kill autologous activated T cells. We then verified that identical mechanisms are also operational in CD56bright NK cells derived from healthy controls and, finally, we compared the efficacy of these killing mechanisms in MS patients before and after daclizumab treatment. We first had to overcome the constraining requirement for a large number of sorted CD56bright NK cells, which is necessary for the chromium release cytotoxicity assays used in our previous study (19). Therefore, we adopted a flow cytometry-based killing assay, which allows discrimination of the degranulating effectors and dying targets in complex mixtures. We fully reproduced our published observations from chromium release assays (19) that NK cells kill only activated T cells and that the CD56bright NK cell subset is the predominant effector in such immunoregulation of autologous T cells. By applying agents that selectively block different mechanisms of cytotoxicity, we were able to conclude that NK cells predominantly use the granule exocytosis pathway to induce a caspase-independent, mitochondrial form of apoptosis in activated T cells. This form of apoptosis depends on the induction of intracellular ROS in the target cells and is characteristic of killing mediated by two closely related tryptases, GrA and GrK (22). The demonstration that killing can be significantly inhibited by application of the strong antioxidant NAC or by bongkrekic acid, which inhibits formation of mitochondrial permeability transition pores, was substantiated by parallel observations that coculture with NK cells increases ROS and decreases mitochondrial potential in activated T cell targets. The independence of this killing mechanism from caspase activation was further corroborated by a lack of enhanced staining of target cells for activated caspase 3. Because GrA and GrK use very similar effector mechanisms (i.e., ROS and mitochondrial dysfunction) to induce apoptosis in target cells and selective inhibitors of either GrA or GrK have not been developed, we cannot directly quantify the proportional contribution of GrA and GrK to CD56bright NK cell cytotoxicity toward activated autologous T cells. However, the granzyme transfer experiments implicated GrK as a major player in NK cell-mediated cytotoxicity toward activated T cells. This was consistent with the observations that GrK is selectively expressed in CD56bright NK cells (32, 33) (Supplemental Fig. 1) and with preferential degranulation of this NK cell subset upon coculture with autologous activated T cells. Furthermore, partial (i.e., up to 47%) genetic silencing of GrK in the immortalized NK-92 cell line, which retains functional characteristics of primary human CD56bright NK cells, resulted in 42–71% inhibition of killing of syngeneic autologous T cells. The fact that the NK-92 cell line killed its syngeneic T cell targets utilizing identical effector mechanisms as CD56bright NK cells (i.e., induction of mitochondrial dysfunction and formation of intracellular ROS) validates its use as an appropriate model system. By understanding the molecular mechanisms used by CD56bright NK cells to kill autologous activated T cells, we could compare expression of different granzymes and their transfer to autologous activated T cells in patients before and during daclizumab therapy. We observed robust differences between the two groups: NK cells derived from daclizumab-treated patients were significantly more cytotoxic toward autologous activated T cells than were those derived from patients at an untreated baseline. Perhaps most importantly, the differences did not reside solely in more CD56bright NK cells observed in treatment group, but also in a significantly higher expression of GrK in the CD56bright NK cell subset of treated patients. This observation provides further support for the role of GrK in the immunomodulation of T cell responses by CD56bright NK cells. Although collectively our data represent, to our knowledge, the first example of a physiological role of GrK in cellular cytotoxicity in humans, our experiments do not exclude contribution of GrA to killing of activated T cells by CD56bright NK cells. In fact, due to their joined expression in CD56bright NK cells, it is reasonable to assume that both tryptases work together, and owing to their mostly nonoverlapping substrates, they may also have synergistic effects. Our initial report that CD56bright NK cells are expanded during daclizumab therapy and that their expansion correlates with treatment outcome (19) has now been fully reproduced in an independent, double-blind, placebo-controlled trial of daclizumab in MS (18). Defining the molecular mechanisms of this immunoregulation opens the way to future studies needed to investigate whether CD56bright NK cell-mediated killing of activated T cells is defective in MS patients as compared with controls and whether this deficiency corresponds to previously reported functional defects of NK cells in patients with MS and other autoimmune disorders. We hope that this knowledge will also translate into future developments of more effective therapies that selectively restore deficient immunoregulatory circuits. In summary, the present study demonstrated that immunoregulatory CD56bright NK cells kill autologous activated T cells utilizing a perforin-dependent degranulation pathway mediated by two closely related granzymes, GrK and GrA. This immunoregulatory mechanism is significantly enhanced by treatment with daclizumab, but is inhibited by strong antioxidants, because both of these granzymes kill via the mitochondrial mechanism of apoptosis that depends on the induction of ROS in the target cell. Thus, we suggest that administration of potent, cell-permeable antioxidants during ongoing immune response may generally boost development of adaptive immune responses, including immune memory, which is a desired outcome for immunity against infectious agents, but may be detrimental for autoimmunity. Clearly, this concern is entirely theoretical at this point and has to be addressed in properly designed clinical trials. B.B. is a co-inventor of several National Institutes of Health patents related to daclizumab therapy and has received patent royalty payments. The remaining authors have no financial conflicts of interest. We thank Azita Kashani for expert technical assistance in processing apheresis samples. We also thank Dr. Irene Cortese for critical review of the manuscript and Dr. Pierre Henkart for helpful discussions. This work was supported by the Intramural Research Program of the National Institute of Neurological Disorders and Stroke/National Institutes of Health.
. 2007. Risk alleles for multiple sclerosis identified by a genomewide study. N. Engl. J. Med. 357: 851–862.
. 2000. Clonal expansions of CD8+ T cells dominate the T cell infiltrate in active multiple sclerosis lesions as shown by micromanipulation and single cell polymerase chain reaction. J. Exp. Med. 192: 393–404.
. 2004. Loss of functional suppression by CD4+CD25+ regulatory T cells in patients with multiple sclerosis. J. Exp. Med. 199: 971–979.
. 2006. 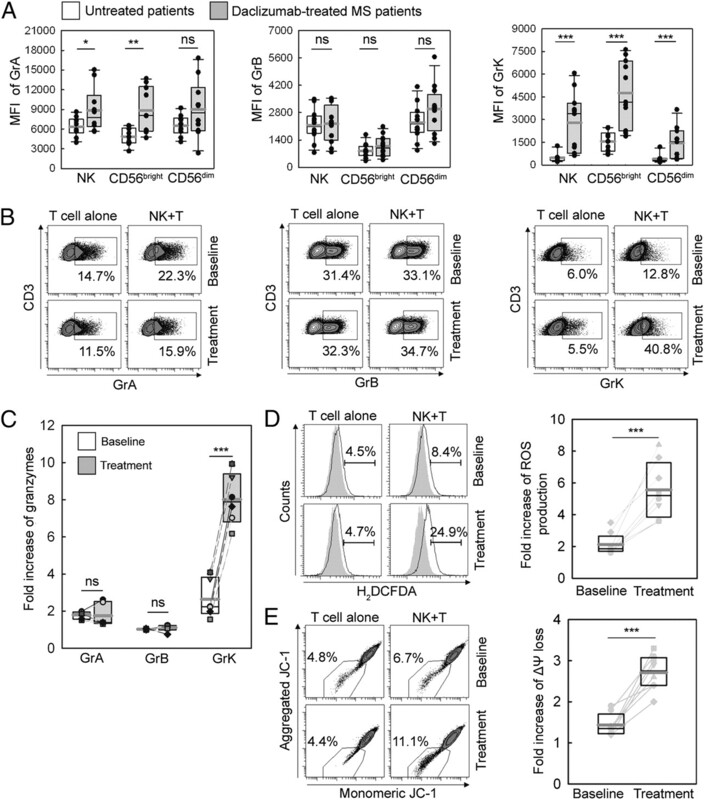 Alterations in CD46-mediated Tr1 regulatory T cells in patients with multiple sclerosis. J. Clin. Invest. 116: 3252–3257.
. 1997. Regulation of experimental autoimmune encephalomyelitis by natural killer (NK) cells. J. Exp. Med. 186: 1677–1687.
. 1999. Inhibition of autoimmune T cell responses in the DA rat by bone marrow-derived NK cells in vitro: implications for autoimmunity. J. Immunol. 163: 1390–1397.
. 2003. Activated, but not resting, T cells can be recognized and killed by syngeneic NK cells. J. Immunol. 170: 3572–3576.
. 1980. Dysfunction of natural killer cells in multiple sclerosis: a possible pathogenetic factor. Clin. Exp. Immunol. 39: 657–662.
. 1987. NK activity and NK-like non-specific cytolysis after PPD, rubella and measles antigen stimulation in multiple sclerosis. J. Neurol. Sci. 77: 77–85.
. 1989. Natural killer cell number and activity in multiple sclerosis. J. Neurol. Sci. 94: 115–123.
. 1995. Circulating natural killer cells but not cytotoxic T lymphocytes are reduced in patients with active relapsing multiple sclerosis and little clinical disability as compared to controls. J. Neuroimmunol. 62: 177–181.
. 2003. Clinical relapses of multiple sclerosis are associated with “novel” valleys in natural killer cell functional activity. J. Neuroimmunol. 145: 103–114.
. 1988. Natural killer (NK) cells in chronic progressive multiple sclerosis patients treated with lymphoblastoid interferon. J. Neuroimmunol. 20: 15–23.
. 1998. A role for natural killer cells in the immunopathogenesis of multiple sclerosis. J. Neuroimmunol. 86: 123–133.
. 2006. The neuronal chemokine CX3CL1/fractalkine selectively recruits NK cells that modify experimental autoimmune encephalomyelitis within the central nervous system. FASEB J. 20: 896–905.
. 2004. Humanized anti-CD25 (daclizumab) inhibits disease activity in multiple sclerosis patients failing to respond to interferon β. Proc. Natl. Acad. Sci. USA 101: 8705–8708.
. 2004. Treatment of multiple sclerosis with an anti-interleukin-2 receptor monoclonal antibody. Ann. Neurol. 56: 864–867.
. 2010. Daclizumab in active relapsing multiple sclerosis (CHOICE study): a phase 2, randomised, double-blind, placebo-controlled, add-on trial with interferon β. Lancet Neurol. 9: 381–390.
. 2006. Regulatory CD56bright natural killer cells mediate immunomodulatory effects of IL-2Rα-targeted therapy (daclizumab) in multiple sclerosis. Proc. Natl. Acad. Sci. USA 103: 5941–5946.
. 2009. Effect of anti-CD25 antibody daclizumab in the inhibition of inflammation and stabilization of disease progression in multiple sclerosis. Arch. Neurol. 66: 483–489. 2002. TNF ligands and receptors: a matter of life and death. Br. J. Pharmacol. 135: 855–875.
. 2008. Death by a thousand cuts: granzyme pathways of programmed cell death. Annu. Rev. Immunol. 26: 389–420.
. 2003. Perforin and the granule exocytosis cytotoxicity pathway. Curr. Opin. Immunol. 15: 522–527.
. 2005. Granzyme A induces caspase-independent mitochondrial damage, a required first step for apoptosis. Immunity 22: 355–370.
. 2009. Granzyme K displays highly restricted substrate specificity that only partially overlaps with granzyme A. J. Biol. Chem. 284: 3504–3512.
. 2010. Valosin-containing protein cleavage by granzyme K accelerates an endoplasmic reticulum stress leading to caspase-independent cytotoxicity of target tumor cells. J. Immunol. 185: 5348–5359.
. 2002. Variable receptors controlling activation and inhibition of NK cells. Curr. Opin. Immunol. 14: 615–621.
. 1990. In search of the “missing self”: MHC molecules and NK cell recognition. Immunol. Today 11: 237–244.
. 1980. Low natural in vivo resistance to syngeneic leukaemias in natural killer-deficient mice. Nature 284: 624–626.
. 2003. The natural killer cell-mediated killing of autologous dendritic cells is confined to a cell subset expressing CD94/NKG2A, but lacking inhibitory killer Ig-like receptors. Eur. J. Immunol. 33: 1657–1666.
. 2001. The biology of human natural killer-cell subsets. Trends Immunol. 22: 633–640.
. 2005. Differential expression of the granzymes A, K and M and perforin in human peripheral blood lymphocytes. Int. Immunol. 17: 1419–1428.
. 2005. Differential expression of human granzymes A, B, and K in natural killer cells and during CD8+ T cell differentiation in peripheral blood. Eur. J. Immunol. 35: 2608–2616.
. 2007. Expansion of CD56bright natural killer cells in the peripheral blood of multiple sclerosis patients treated with interferon-β. Neurol. Sci. 28: 121–126.
. 2009. Interferon-β-1a treatment increases CD56bright natural killer cells and CD4+CD25+ Foxp3 expression in subjects with multiple sclerosis. J. Neuroimmunol. 215: 125–128.
. 2005. Severe and progressive encephalitis as a presenting manifestation of a novel missense perforin mutation and impaired cytolytic activity. Blood 105: 2658–2663.
. 2008. Variations of the perforin gene in patients with multiple sclerosis. Genes Immun. 9: 438–444.
. 1994. Characterization of a human cell line (NK-92) with phenotypical and functional characteristics of activated natural killer cells. Leukemia 8: 652–658.
. 2001. NK cell functions restrain T cell responses during viral infections. Eur. J. Immunol. 31: 3048–3055.
. 2010. Central nervous system (CNS)-resident natural killer cells suppress Th17 responses and CNS autoimmune pathology. J. Exp. Med. 207: 1907–1921.
. 1998. Role of natural killer cells and TCRγδ T cells in acute autoimmune encephalomyelitis. Eur. J. Immunol. 28: 1681–1688.
. 2002. The role of NK cells in autoimmune disease. Autoimmunity 35: 1–14.
. 2004. Natural killer cells and autoimmunity. Arthritis Res. Ther. 6: 8–14.
. 2001. Human natural killer cells: a unique innate immunoregulatory role for the CD56bright subset. Blood 97: 3146–3151.
. 2003. CD56bright natural killer cells are present in human lymph nodes and are activated by T cell-derived IL-2: a potential new link between adaptive and innate immunity. Blood 101: 3052–3057.
. 2006. Natural killer cell behavior in lymph nodes revealed by static and real-time imaging. J. Exp. Med. 203: 619–631.